Rothenberger P/N 5.9022. 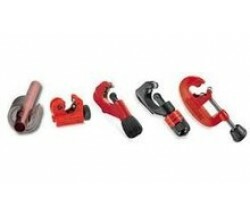 Plastic Pipe Cutter Which Cuts Clean and Square..
Ridgid P/N 33170 To Cut Aluminium & Copper To Suit Pipe Cutters Cat. No Please Refer To Comparisi..
Ridgid P/N 33125 To Cut Grey Cast Iron To Suit Pipe Cutters Cat. No Please Refer To Comparision C..
Ridgid P/N 44185 To Cut Steel Pipe & Ductile Iron Please Refer To Comparision Chart..
Rothenberger P/N 7.0046 To Cut Steel..
Rothenberger P/N 7.0051 To Cut Steel..
Rothenberger P/N 7.0089 To Cut Stainless Steel Please Refer To Comparision Chart..
Rothenberger P/N 7.0056 To Cut Stainless Steel..
Rothenberger P/N 8.8803 To Cut Aluminium & Copper..
Rothenberger P/N 5.2005 For Cutting Plastic Pipes Up to 26mm..
Rothenberger P/N 8.8801 Single Action Tubing Cutter For Tight Spaces..
Rothenberger P/N 7.1085 3-30mm Tube Cutter For Stainless Tubing Incorporating Extra Hard Rollers &..
Rothenberger P/N 7.0027 For Cutting Copper Tubing 6-35mm Cap..
Rothenberger P/N 8.8813 Single Action Tubing Cutter For Tight Spaces..
Rothenberger P/N 5.5091 Ratchet Pipe Shears 0-42mm Cap..